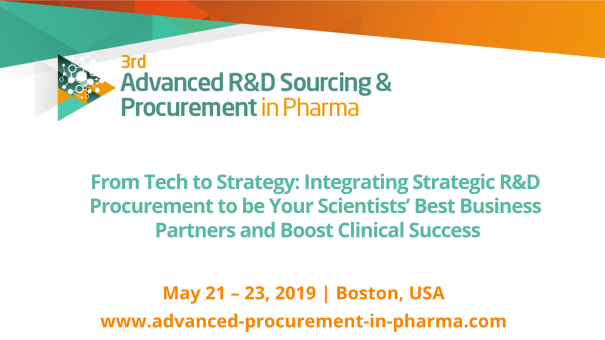 As the only R&D procurement meeting focusing on pharma/biotech industry, the 3rd annual Advanced R&D Sourcing & Procurement Summit will bring together market leaders to meet in Boston to share project updates, exchange ideas and discuss common challenges this May in Boston. The unique positioning and niche focus allows in-depth and peer-led learnings from your fellow colleagues – hoping to give you the best impacts and takeaways in 3 days. Coming to the 3rd year and as the industry starts to mature, we will shift our focus to how R&D Procurement can be the best internal business partners to scientific teams – implementing strategic sourcing and category management, and supplier management will definitely enable faster access to technologies, services and more flexible partnership model. Join us in 2019 to get inspired for new sourcing and procurement approaches, and be your scientific colleagues’ best business partners!